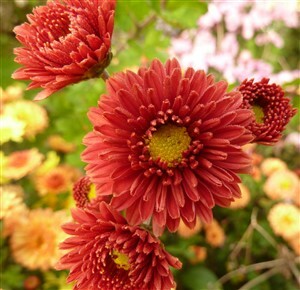 Chrysanthemum 'Helen Ward' (2.5'). A plant we have raised here with double pom-pom heads of rain washed red, giving an old-fashioned feel like luxurious leather. Unique and very rare, we have been inundated with requests for this and I decided to name it for my lovely, understanding wife. Sun, reasonable soil, but very hardy.